Unlike mechanical models, the pneumatic impact helps to ensure minimum exertion by the operator, making high-volume jobs more ergonomically compliant. 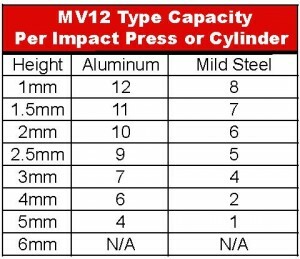 The MV12AP is a allows you to deliver 1,500 pounds of force that can be used in indexing tables, transfer systems or assembly machines. The adjustable impact force remains constant and is not altered by length of stroke, but by adjustment of spring compression. 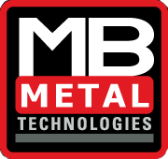 MB Metal Technologies offers a variety of springs for lighter or heavier marking, depending on the substrate to be marked. All MB Metal Technologies air impact models feature a dual-palm push button control for enhanced safety. Both hands are needed on the control panel, keeping them away from the powerful marking head. When hands are removed from the controls, the marking head returns to its top position. The MV12AP adapts to a wide variety of impact jobs, using available tool inserts and marking heads. 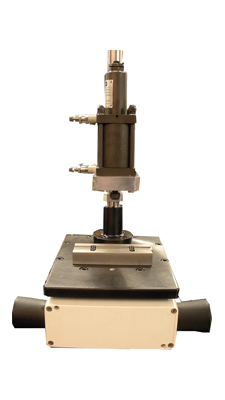 Units operate in any position and mount at either end using four tie rods with extended threads. The clean, simple design with few operating parts, reduces maintenance. Working 2D and 3D CAD files are available.